Home » NMT » Suitability of public NMT in the city? Suitability of public NMT in the city? 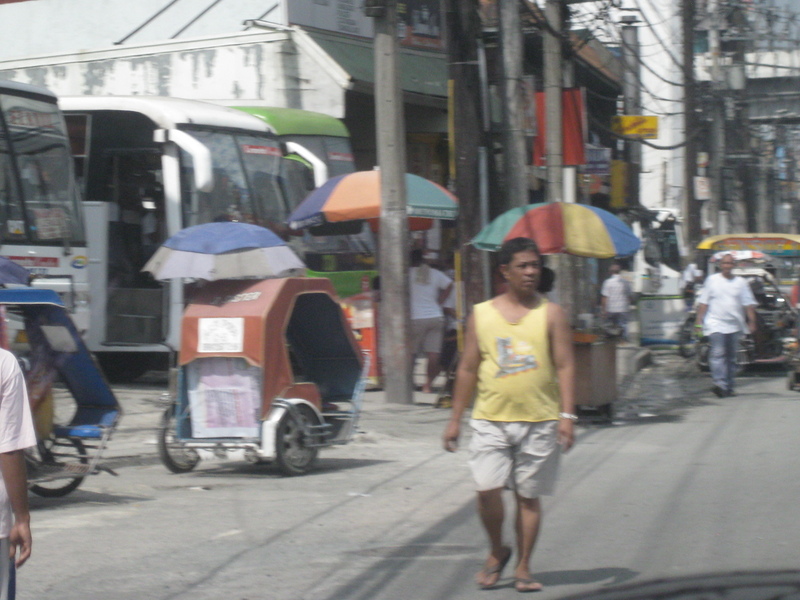 Paratransit systems are a common thing all around the Philippines. Some have been part of the mainstream that to call them paratransit seems inappropriate. Among the most dominant modes of transport in the country are the jeepneys and motor tricycles that serve short to very long routes in many areas in the country including the National Capital Region. There is also the so-called kuliglig in the City of Manila that is a 3-wheeler comprised of a bicycle and a side car. The bicycle is motorized, using a small motor much like the one used by pumpboats or bancas. These are very much the same as the “tricyboats” of Davao City and other parts of Mindanao and the Visayas. The “original” kuliglig may be found in rural areas and these are basically farm tractors pulling carts that may be used to transport people or goods (e.g., farm products, raw materials, etc.). When the term “non-motorized transport” or NMT is mentioned, the first things that come to mind are probably bicycles and walking. There are other NMT modes around including animal drawn vehicles and pedicabs. Perhaps the most well-known animal drawn vehicles in the Philippines are the calesas and caretelas, which are pulled by horses. Pedicabs are 3-wheeled vehicles consisting of a bicycle and a side car. These are quite popular in residential areas particularly in residential subdivisions or villages where tricycles have been prohibited or restricted due to their noise and emissions. Pedicabs, however, have become an attractive means of livelihood for people who have less options for employment (i.e., many drivers have no qualifications to apply for more formal jobs). As such, one will find them proliferating where there is a perceived demand for them; including urban streets where they serve as feeder services quite similar to those offered by their motorized counterparts. While tolerated along minor streets, many have tested the waters and the limits of regulations by taking major roads. The following photos show such examples where pedicabs are seen operating along major roads. Cause of congestion? 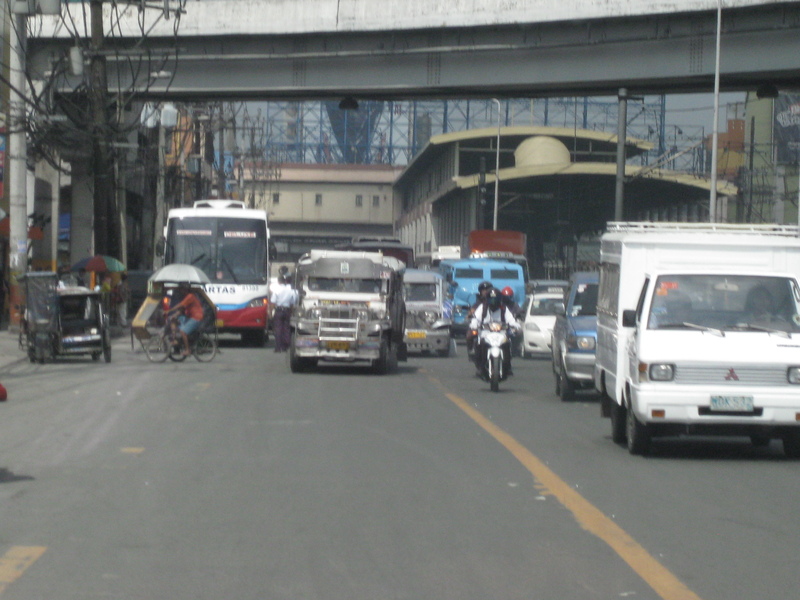 – pedicab (and tricycle) operating along the bus lanes of EDSA in Pasay City. Such situations expose drivers and their passengers to risks of being hit by larger motorized vehicles such as buses and trucks. Over-reaching? – pedicabs defy regulations against them using national roads and particularly major ones like EDSA. There is the persistent challenge of how to rationalize public transportation in many Philippines cities. In fact, there are cities that have embraced paratransit modes as part of their character and thus seem unlikely to upgrade or phase out such transport modes from roads or routes that require higher capacity vehicles to deliver higher levels of service. For one, there are socio-economic and political factors that have to be considered in any initiative focusing on these modes of transport. Many are already organized or members of organizations such as tricycle operators and drivers associations (TODA) and jeepney operators and drivers associations (JODA). These have become quite influential over the years and have even participated in elections as party list groups while also exerting pressure on government agencies when issues like fuel price increases and fare setting are in the spotlight. Many public NMTs are not as organized or empowered as their motorized counterparts. However, many are connected with groups such as those of the urban poor and NGOs taking their side when issues are raised regarding their operations. Perhaps these NGOs should take a closer look at public transport as not just a source of livelihood considering the responsibilities that come with providing such services. And perhaps they should also busy themselves with helping people learning skills that will not commit them and their descendants to being jeepney, tricycle or pedicab drivers. By d0ctrine in NMT, Paratransit, Public Transport on October 21, 2012 .